Four current Saybrook psychology students accompanied faculty members Louis Hoffman, Ph.D. and Mark Yang, Psy.D., on a week-long trip to China in late April where they helped the faculty members to teach psychology students from all over that country. 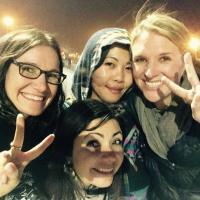 Kristen Beau Howard, Anne Hsu, Monica Mansilla, and Jenna Noah all made the long trip then shared a conference call interview in May to relate their experiences. In Beijing the students encountered a group of more than 45 students from all over China enrolled in classes leading to a certificate in existential psychology by Professors Hoffman and Yang. Some Chinese students had extensive psychology backgrounds, many were practicing therapists, some already had group experience, and about half of them had completed a two week-long certificate focused on humanistic psychology. While the four Saybrook students are studying psychology as well, they found themselves with a lot more experience than their Chinese counterparts and were expected to give presentations, do demonstrations, and even mock supervision sessions. “We four are also students but we were placed in a type of teacher role because of the presentations that we made, and from being farther along in our educational processes as graduate students,” said Jenna. It was seven full days of presentations and interaction, certainly an intensive learning experience. That intensity created a rich experience that all four women shared, and that richness translated into motivation to study harder once back home. “I found a new form of motivation for academia, for presenting and just being near and around different academics. Now I’m more inspired to write papers than I ever thought possible before!” exclaimed Jenna. “It was an unexpected advantage of the trip for me–my dedication and my interest in East-West Psychology, but the academic process in general!” she said. It was a paradoxical experience going over there right in the middle of the semester, according to Kristen. “We were right in the middle of writing papers and I was traveling all the way over there, experiencing jet lag and taking all this energy. While it was so exhausting, I GAINED so much energy and empowerment from it that it seems like a paradox…of joy!” she said. Another element that made the experience wonderful for her was seeing the similarities they shared with the Chinese students. “We were all connecting to other human beings on that real level. It was just wonderful!” she said. Monica said, “The richness of the experience gets translated into the academic work we do at Saybrook.” She shared that she was taking the Rollo May course that semester with Dr. Ed Mendelowitz and there were many complex concepts that were difficult to understand. After returning from China, “I actually had chats with him that I came back understanding many things that I didn’t understand before. That felt really beautiful,” she said. One of the other sentiments that all four students shared following the China experience was the paradoxical feeling of a sense of a community, even on the other side of the world. “With Saybrook we can forget that we actually have classmates!” said Anne. “There is that particular aspect of Saybrook that we’re all out on our own and we’re doing that heavy work in psychology. But one of the highlights of this trip for me was getting to know and spend so much time with these three other women”, said Kristen. Listening to Louis Hoffman open the workshop and introduce the history of Saybrook interwoven with the history of humanistic and existential psychology, several of the women remarked that they wished they had had this same type of introduction at their Residential Orientation. “I walked into Saybrook thinking I was going to graduate school, but not knowing much about Saybrook itself. Now I feel very proud to be at Saybrook, and I wish that more students knew what Saybrook really is,” said Monica. “Everybody was really wanting to learn,” said Kristen. “They’re incredibly well read, but they don’t have access to all our texts in English—only those that have been translated.” She also noted a huge willingness to engage on the part of the Chinese students, even despite all the differences. “Yet with this willingness on the whole of the group to engage in those differences, in the end all you could see was our sameness—human beings connecting together on a human level,” said Kristen. Monica added, “the cost of the trip, after I made all the calculations, was almost equal to what I spend coming to RCs!” Depending on your degree program, attending and participating in this week-long conference can be substituted for the Saybrook Residential Conference in that semester. For more information regarding the International Existential Psychology certificate and the annual China trip, please contact Louis Hoffman ([email protected]) or Mark Yang ([email protected]).